This week we're presenting the The Glass House, Cape Cod Museum of Art, and Gallery 175 that offer interaction with landscape, photography, sculpture and wax to engage in examinations of location and materials. 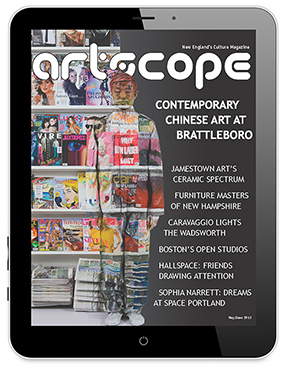 Artscope is excited to be sponsoring the Copley Society of Art hosting its 29th annual Fresh Paint Gala and Silent Auction on Thursday, May 4 from 6:30-8:30pm. The Glass House presents Wax Paintings from the 1970s. On view now through June 5, the exhibition displays work from private collections. This series offers a glimpse into Julian Schnabel's first steps into painting. The six pieces on display at the Glass House were all drawn before his first solo exhibition in New York City at the Mary Boone Gallery in 1979.These works present themes woven throughout the artist's style. The artist layers a silky wax and modeling paste to tempt the viewer towards the surface and to offer insight into the artist's process.The multiple layers of dense wax add a third dimension to the piece. Schnabel also notched into the surface of his paintings and built off these marks to represent the passage of time. It takes many years to hone a unique style. This is proven in Schnabel's pieces such as in Accattone, with the deep raw tones of red wax, and in Procession (for Jean Vigo) amplifying the contrasting use of black and white wax. For more information about this exhibition visit the Glass House's website here. John O'Reilly: A Studio Odyssey May 13 - August 13, 2017 Lauded by The New York Times as "one of our greatest living artists of mysterious, erudite, and confounding photomontages," John O'Reilly creates intricate assemblages that fuse together art history, literature, and autobiography. Nationally celebrated, O'Reilly is a Worcester-based artist whose composite artworks investigate eroticism and violence, often through the inclusion of self-portraiture. Join us for an opening reception with the artist on Thursday, May 18 from 5:30 to 8pm. Free with Museum admission. We've moved! FOUNTAIN STREET gallery is now in SoWa Boston! On May 5th,during SoWa Boston 1st Fridays, Fountain Street gallery opens its inaugural Boston exhibit: "Scarcely Awake," the work of Sarah Alexander and Tatiana Flis. Alexander's and Flis' works carry similar themes of time, movement, and the subconscious, while walking the fine line between reality and the imagined. Fountain Street Gallery, now located at 460C Harrison Avenue, Suite 2, in Boston's SoWa Arts District. Open Wed-Sun 11-5. From May 3 - 28, Bromfield presents "SOAP" by Laurie Alpert, mixed media prints that transform the ordinary, and "Stratum/Substratum" by Lesley Cohen, drawings that peel back the everyday world. The opening reception is Friday, May 5, from 6-8:30 pm. On Saturday, May 13, at 2 pm, there will be a Poetry Reading with Music. The Cambridge Art Association is pleased to announce it's 2017 National Prize Show Exhibition, juried by Fitchburg Art Museum Director, Nick Capasso. The exhibition features over 70 artists who reside across the United States. Of the 72 featured works, Capasso has selected five artists for awards. Best in Show Ann Strassman, First Prize Silvi Naci, Second Prize Malcolm Rogers, Juror's choice, Emily Brodrick, Peter Cohen and Tom Diaz. Please join us in celebrating at our opening reception, Thursday May 18th from 6-8pm. Featured Image: Best in Show winner, painter Ann Strassman, from Weston Massachusett. The Vermont College of Fine Arts MFA in Visual Art program-the country's longest-running low-residency program-pairs students with groundbreaking Artist- Teachers, such as feminist art pioneer Harmony Hammond. Our Artist-Teachers are graduate-level educators and practicing artists who build relationships with students as mentors, critics, and as links to their regional artistic communities. Learn more. (Link to: http://vcfa.edu/programs-faculty/visual-art/artist-teachers )Image credit: Artist-Teacher Harmony Hammond (right) with current VCFA MFA in Visual Art student Christa Marquez Smith (left) during the July 2016 residency. Contrasts:Varying Visions from Six Master Photographers is a group exhibition featuring six seasoned photographers inside the Cape Cod Museum of Art and two off-site pieces of public art. This exhibit juxtaposes contrasting styles and techniques in photography through a series of pieces from six New England photographers.These photographers are respected nationally and internationally for their artistic prowess in this art form. From Massachusetts, Connecticut, and Maine,the photographers are: Fran Forman, Cig Harvey, Andrew K. Howard, Lou Jones, Sean Kernan,and Karin Rosenthal.The work focuses on the diversity of emotionally compelling images, camera types, lighting methods, development processes and technology. The goal for the exhibition raises the question being asked in our photographic world today. "Is the art of photography changing? It's often directly or indirectly affected by new technology. We want to celebrate the fascinating variety of approaches, from the traditional to the computer generated, that photographers are using to communicate their personal and aesthetic expressions today," said Edith (Deede) Tonelli, director of CCMoA. For a more in-depth description of the exhibition and the artists,visit the Cape Cod Museum of Art website,here. You are invited to the 2017 Associate Members' Exhibition opening reception this Saturday, May 6th at the Red Gallery in Providence Picture Frame from 5-8pm. This year over 30 Associate Members, displaying 70 works of art, are participating in this annual exhibit. For more information, visit www.artleagueri.org.